The program sought to “chart how Australians are adapting to the new weather challenges.” In this the program was an outstanding success. It also made very clear that directors of companies in whatever sphere would be negligent unless they fully consider climate risk. Where the program came up short, I think, is that adaptation as a sole strategy will ultimately fail. Climate mitigation is required if the human story is to continue in a positive direction, however your philosophy describes it. Currently we are on a path to 3 to 4°C by 2100, which is where civilisation as we know it is on the line. Science is telling us we have to act seriously on emissions now if we want to avoid serious disruption of the human story. That said I’ll highlight and comment on a few aspects of the report. The first field report with the pastoralist Martin Royds contained interesting information. 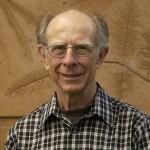 He had found that temperatures on their property had risen by 2.4°C since 1985, that’s 0.8°C per decade. That seems on the high side, and I don’t have a clue as to why. World temperatures have risen by about 1°C since the late 19th century. 70% of the earth is water, and the land warms more, also more at higher latitudes, but I don’t think that explains the difference. Nevertheless it was one point on the continent and Royds was measuring and dealing with his own reality. There is a growing band of regenerative farmers who are saying, you know, we can’t modulate the temperatures back down again by getting better ground cover, more water in the system, more trees, etc. If we don’t do that, then I may as well sit on a beach somewhere, I suppose. It seems that growing trees and retaining more water on the property for longer cools the land. However, in the general landscape deforestation increases reflectivity, which means that less heat is absorbed. That was one reason why James Hanson thought 350ppm may be sufficient to bring temperatures down. So will limited forstation to the extent he is planning it increase or lower world temperature? The wine industry information was detailed and specific, obviously bringing into question traditional wine growing areas. From that the program went to the risks stemming from sea level rise. 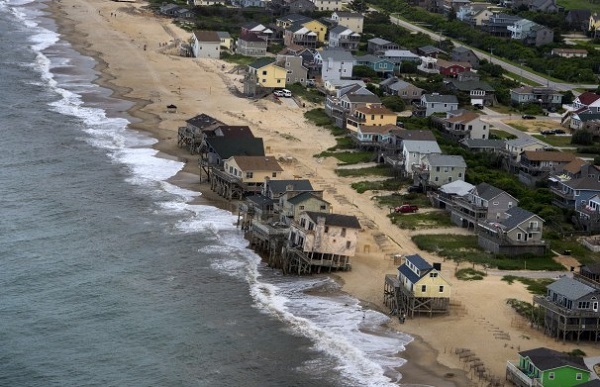 It seems already that most properties are not covered for sea level rise. The program is to be congratulated for not simply following the IPCCC report, now five years old, and was always out of date. Too often their projection of 0.7 metres is used, neglecting the fact that it largely left ice sheet decay out of consideration. They cite 2 to 2.7 metres from recent NOAA report. In November 2016 in the post Ice sheet decay spells danger from sea level rise I cited work by Robert M. DeConto and David Pollard suggesting sea level rise may be of that order, mainly because of work done on what might happen in Antarctica. Their latest in December 2017 suggests 2 to 3.5 metres, but the important finding is that we won’t be able to make a decent judgement on what will happen by 2100 until as late as 2060. This is based on the notion of ice sheet loss doubling every 10 years, from memory. Hansen’s intention was twofold. Firstly, it is far too early to work out what is going to happen. Secondly, large numbers cannot be ruled out. There has been a tendency to rule out anything above two metres because Greenland’s underlying topography is shaped like a saucer, and the glaciers need to find their way through gaps in the mountains. West Antarctica is vulnerable but limited in size, whereas East Antarctica is mostly a solid lump which will just sit there. Since then northern Greenland has been found to have an opening where the sea could penetrate far inland, scientists have become more aware of the possibilities of warm sea penetration under the Antarctic ice, the large Totten glacier in East Antarctica could open up 350 to 550 kilometres inland, and now DeConto and Pollard have drawn attention to the possibility of “hydrofracturing,” implicated in the 2002 breakup of the Larsen B ice shelf on the Antarctic Peninsula. Hydrofracturing could leave broad swathes of the Antarctic coast with 300-foot tall cliffs of ice exposed to the open ocean and subject to collapse under their own weight. 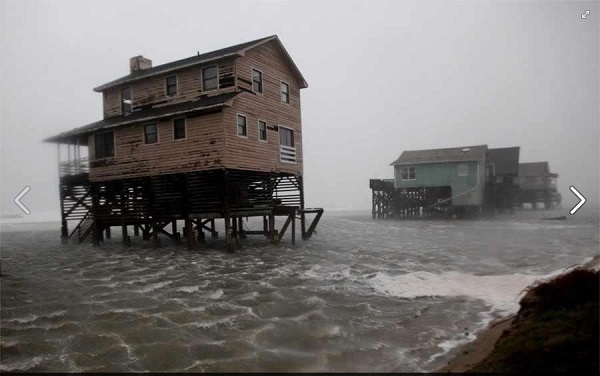 The bottom line is that people involved with real estate or any development subject to sea level rise should include in their calculations the possibilities of what might happen after 2050, and that could be very challenging indeed. We should also remember that The sea is anything but level so that if you swam from a point south of India to Indonesia you would be swimming 200 metres uphill. 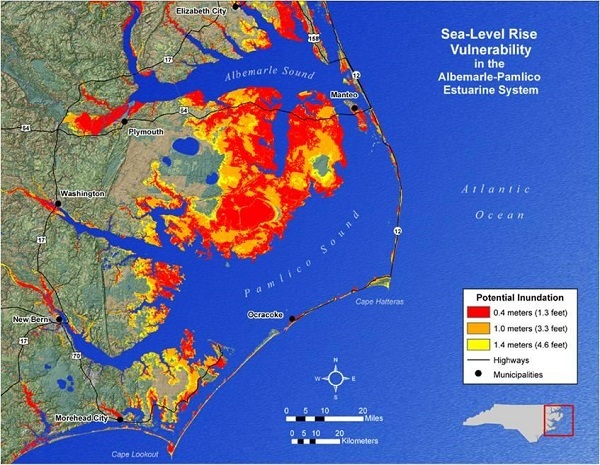 It will be hard to predict how sea level rise will affect specific locations. 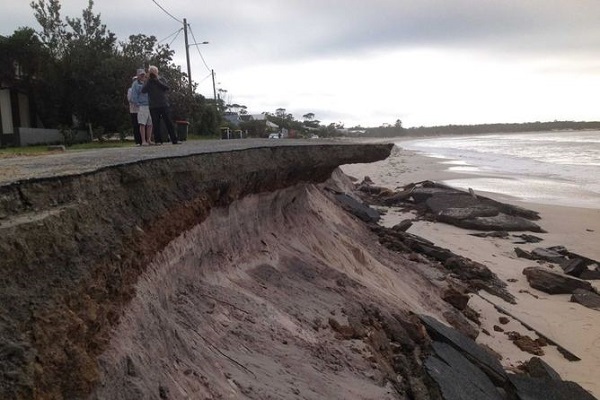 The program warned that a 2-metre rise would render Sydney Airport unusable, and most of Cairns unlivable. Following are some photos previously published. 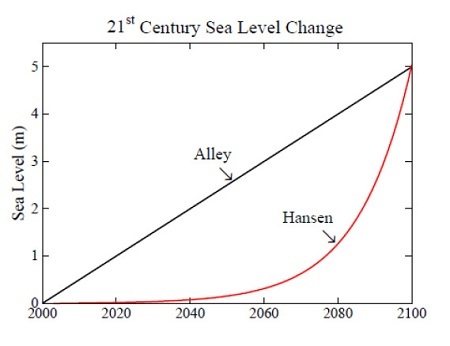 Also Hurricane Sandy-sized floods will be up to 17 times more likely by 2100. 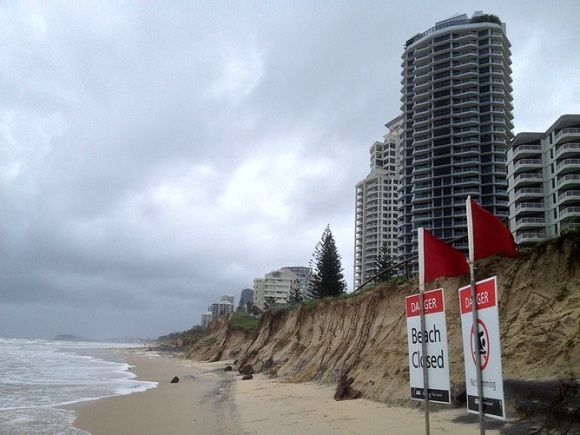 Sea level rise is a real and present danger, but will get worse – a lot worse. The change in the weather has happened faster and earlier here than almost anywhere else on the planet. Climate change is real, present, already dangerous, and relentless. My basic point, however, is that we should not be leaving it it people like David Spratt and Ian Dunlop to call for urgent mitigation action. Honestly, I think climate scientists could be doing more. I think also that the Greens and Richard Di Natali should be looking further than how they can knock off the next inner-urban seat. They should be sounding a more general warning. However, accurate, concrete programs about lived reality, as they say, contribute to changing the climate of opinion. From that perspective the program was, as John D said, outstanding. That is a fascinating example of how the behaviour of many systems is not linear , Brian. I think it may be because we are bombarded by economic and financial figures, that many of us start to believe most changes are “linear”. If an export volume rises by 10% and the price is steady, the exporters’ incomes rise by 10%. If an export volume is steady but the price drops by 30% or the exchange rate changes, the export income changes proportionally (linearly). But plenty of other examples follow other graphs or relationships….. It is about time that farmers and business people stopped supporting the LNP coalition. The event organisers asked the speakers to reflect on the question: Do we have the capability to reverse global warming within a meaningful timeframe? Have we left our run too late? Ambi: A lot of agriculture is non-linear. Push the temperature up that bit more or reduce rainfall that bit less and a profitable cherry orchard is suddenly out of business. All over the place in the natural world: narrow temperature bands for optimum growth or for plain survival. Agriculture = applied ecology, or should. No, no, Ambigulous; you’ve got it all wrong. Strip as much as you can out of the ground – then flog off the property to another corporate investor; settle the sale fast and move the money to an off-shore tax-haven before anyone finds out that the pre-sale production figures were as rubbery as billyoh. Easy. Currently watching Four Corners on Australia’s population growth. In a word: Advertorial.